You are here: Home / Common Questions / How long will someone with Alzheimer’s dementia Live? Being diagnosed with Alzheimer’s isn’t an immediate death sentence. People with Alzheimer’s can live for a long time. The life span of someone with Alzheimer’s dementia is more affected by other medical conditions now and prior to being diagnosed with Alzheimer’s. It also makes a difference if a person is living a busy, active lifestyle, as this tends to extend life. My Mom was in her late 70’s when diagnosed and lived till age 82. But, Alzheimer’s wasn’t the main cause of her death. Mom had heart disease before the Alzheimer’s diagnosis and eventually passed away from lung cancer, though she had never been a smoker. Many major illnesses weaken the system so much that it is not unusual for co-morbidities to exist. I have COPD and it’s exactly the same. When our body is in a weakened condition, we are more likely to have other dire medical conditions. So no, we aren’t able to tell how long someone will live with Alzheimer’s dementia. Generally, it does appear that women live longer than men with Alzheimer’s, but that is true for the general population as well. Women tend to live approx 6 years after they are diagnosed, but men usually live approx 4 years. That doesn’t mean they only live that long after Alzheimer’s disease begins but rather after they are diagnosed. Many have had Alzheimer’s for 10-15 years or more before they actually received a diagnosis of Alzheimer’s or Dementia. Looking back, I’m sure my mother had it for many years, even before her husband passed away. Yet, with his assistance when she could no longer function in a particular area, her incompetence wasn’t noted. As her children, we never noticed a distinct difference in her behavior until she lived alone. During studies, American’s with Alzheimer’s survived about half as long as those of a similar age without Alzheimer’s. The older a person is when diagnosed, the shorter the life expectancy also. My mom only lived about 3 years after being diagnosed but she was already in her late 70’s. And, she had shown symptoms for many many years which we had attributed simply to “old age.” She may have actually had Alzheimer’s for 10+ years. So there are many variations and considerations to be studied before anyone could even guess at their life expectancy. 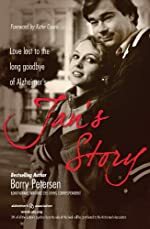 Barry Petersen heard the diagnosis “Early Onset Alzheimer’s Disease” for his wife, but could scarcely believe it because they were in their prime and he was at the top of his career. Barry says, “Imagine hearing these words: “She has Alzheimer’s.” Now imagine that “she” is vibrant, active, loving, healthy…and just 55. EARLY ONSET ALZHEIMER’S. Jan’s Story is a full, rich story of two people–and thousands like them–for whom “forever” suddenly and terrifyingly has an expiration date. Barry Petersen is a long-time, award-winning TV journalist who has covered wars, the devastating Asian tsunami, the historic confrontation at Tienanmen Square, the unspeakable deaths in Rwanda, and so much more…but was not even slightly prepared for what happened to his darling wife, Jan.
My mom has had it 3 years now. We first noticed things she normally could operate like cell phones, excetra slowly to where she couldnt get them to work. Gps was the worst, she went thru 3 bc she said something was wrong with them. I traveled alot over the years working so it was hard for me to be with her. When i did get back in town from trips seems like i would spend hours there on my way home to try and help. What bothers me now is the fact I need to take the car away before she hurts someone or herself. I spent about 3 hours looking for her one night bc she took of in that car without her cell phone. Finally i get a call from her and she is 10 miles up the road. I have finally moved in to help her, but it is hard and had to take a aort of demotion in what i was doing for work. I notice the littlest things will cause an arguement, even tho my brother and i try to watch what we say, it still happens on a regular basis. This may not be advice, but should show some that we all have the same commons grounds, try and help as much as we can and take off some of their burden. Am starting on my 4th year as fulltime caregiver for my ‘Hero’, Dad… Left my home, family, job, and friends to move back home…Also living here is Mom & sister, whom both are remain in denial & refuse to assist me in any/all dynamics of running 3 homes, income properties, or any day to day needs for Dad (24/7) He has had a recent fx. to his leg & surgery. Upon return home x3mos., he has progressed tenfold into this disease:(. I am now entertaining long term care, difficult @best. Ahh Melanie, you are a good daughter to be standing between your dad all other family turmoil. It is difficult to be a caregiver in any circumstance and your situation is doubly so because of the lack of support from other family members. Have you tried calling anyone from the Alzheimer’s Association in your area? They have an #800 (1.800.272.3900) where they will refer you to the number you need, or offer help themselves. They can offer lots of help. From having someone speak with others in your family to mailing you literature that you’ll need to make any decisions about available help and care in your area. There might be a daycare center he could attend to give you relief and receive more help that he may need. I’m hoping you will call the Alzheimer’s Association. I just feel certain they can offer some help. Thank you for sharing your circumstance and keep strong on your course to do what’s best for your dad. I hate Alzheimer’s. I just spent 30 minutes explaining my situation and I got kicked out! I am so stuck in a horrible situation I don’t know what to do. My mom was diagnosed 5 years ago maybe longer. Her mom died early was taken away as a ward of the state and my mothers biggest fear is being institutionalized. I promised it would never happen. However my 50 year old brother moved into her house, no life, no job and is taking over. Yes he helps, he does what I can’t I have 6 children. I talk to her daily but can’t be there. No point to really. But she has gone through her savings of 40 grand. I knew it was going to happen, though she argued it was her security. I don’t want to blame my brother but what else? I told her this was going to happen and walked away from it because she was obsessed with having it. Now it’s gone. She doesn’t get out of bed. She drinks daily with my brother which disgusts me and she’s been told not to. Ahh Jenni, what a sad situation for you and your mother. I can hear how much you love your mother in your voice. I know you love your brother too, but if he is drinking and using your mother’s finances that is “elder abuse”. And, he may be cruel to her one day as well if she becomes more difficult to take care of. And, without income, she will certainly become neglected since she can not fend for herself. If your mother is on social security, the state will use her funds to move her to a safe place. This would not be an Institution such as your Grandmother was taken, but a care home where your Mom will be cared for with kindness. I don’t know where you are located but in most states, they have laws about the elderly just like laws for children. If they know an elderly person is being abused by another, they will take action just as quickly as they would for a child being abused. I certainly understand how you are unable to care for her when you have six children of your own. But you can help your mother by making a few phone calls, Jenni. Tell them all that you’ve told me. They will understand because they see incidents like this all the time. The Alzheimer’s Association will know how to help you and offer assistance or others that you might contact. It isn’t uncommon to have someone take advantage of those with memory loss. And the Alzheimer’s Association will help you know where to turn. Our thoughts are with you, Jenni, and we wish all the best for you. This is a tough time but hopefully it will get better with help from some nice people. Be sure to let us know how you are doing in the future. Our dear Mommy has been struggling with Alzheimer’s for almost ten years now. I am her main caregiver and she is my husband’s Mother. In January she fell and broke her hip and it has been a spiral down hill ever since. Dad passed away eleven years ago and she was strong then. It is so hard to see her leaving us everyday. Before the disease took her mind she begged me to still come once she did not know me anymore. Her fear was real as she watched her own Mom leave us the same way. I pray they find the key to this horrid disease. I love Mommy so very much that I will be by her side until God takes her home. Our love and prayers go out to you and your sweet mother-in-law. You are certainly a precious daughter to stand by her side for all these years. Mom was diagnosed in 2000, dad in 2007. Dad passed away last year in November but mom, well I always say she will outlive me. Recently her Dr changed her meds and put her on, of all things, Ritalin and it seems to be making a difference. She had become almost totally non verbal – but now will speak in single words or phrases. Both her and dad were in the same nursing home – they didn’t know each other at all. The day before dad died we wheeled mom into his room. She sat at his bedside, took his hand and said “my husband”. This from a woman who hadn’t known their relationship for many years. The next day when dad died – I went to see mom, she was lying in her bed, eyes darting back and forth at the ceiling. I asked if someone was there – she told me “I think so.” I told her it was Ron and he had come to say good bye and he was going with the angels…she smiled, told me OK and fell asleep. Dad was diagnosed at age 75 and passed away at 80. Mom was diagnosed at 66 and is still as healthy as a horse at 79. My maternal grandmother spent 17 years in an nursing home before her kidneys failed…she was 87 when she died. Thank you so much for sharing. It certainly shows that Alzheimer’s affects everyone differently. I’m glad you’ve had your mom with you for so long and what a lovely story of your father and mother together. What is so sad and there is nothing you can do for it, is the communication breakdown that people suffer with Alzheimer’s. I am currently caring for a woman who is 76 and was diagnosed two years ago with dementia/Alzheimer’s and does not know she is living in her own home or what she is doing or should be doing. And, just two years ago she was driving. Other than having arthritis she is very healthy and the most frustrating thing that I can see is her not being able to communication with words, I know she is thinking them, but when she goes to speak she can’t remember how to say them. Sometimes she will say a word and then say “No, that’s not right” I always remind her of where she is at, what we are doing, and why she can’t remember due to dementia, and that she is safe. She understand for the moment and she may get sad or say, “oh, well, thank you for letting me know” and we move on. My father was also diagnosed at 55 and now at 58, he is in his later stages of the disease. It has had a devastating affect on my family and with my grandfather passing away from it only a couple years ago. Being concerned, I am taking every effort to prevent this from happening to myself by healthy living and daily intellectual activities.